Synthesizers designed and built by Exclusively Analogue - A tale of two modules..
A tale of two modules..
As I continue building up the modules of the “Tribute” system, for my own set and also for the first of the extra sets for lucky buyers, I have looked at what is beyond the basic set. I was fortunate to have some extra original submodules and PCBs for some of the less common modules including the rare Universal Active Filter (UAF), Lag Processor, and Ring Modulator. Unfortunately the discrete dual transistors used in the UAF means that it will not be possible to make many of them, most likely only 4, before having to do an upgrade of the parts with a resultant possible change in characteristics. I have built up the first UAF using an original 1122 submodule, original main PCB and a new front panel to match everything else in my system. The end result is great both visually and sonically! The Lag Processor and Ring Modulator however are as difficult so I have just ordered the panels for these so that I can include them on my system as well as having some spare if people want them. Because of the problems with the parts for the UAF I have decided to utilise the Multimode filter I originally used in the Aviator in the first of the new “Pioneer” modules. 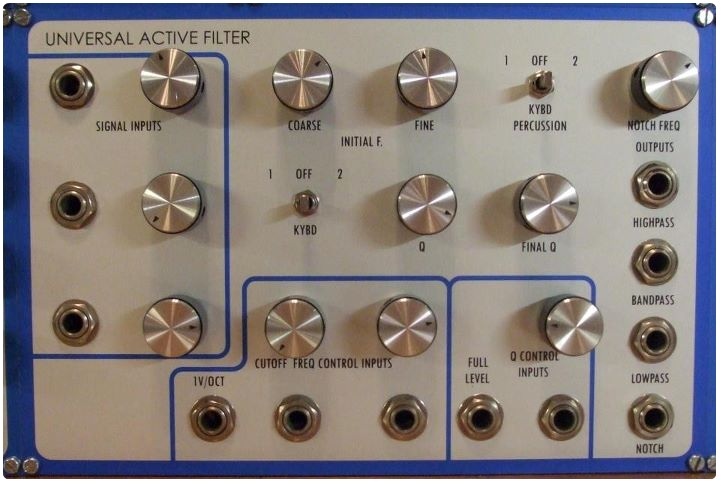 This filter is based on the Oberheim SEM 12dB design and provides Low Pass, Band Pass, High Pass, and Notch outputs so in some respects is very similar to the UAF. The only thing missing is the voltage control of Resonance (Q as Emu call it) but I personally have never really found much use for that function musically. I have aimed to maintain the same look as the original LPF 6″ x 6″ panel with the addition of a Mode selection control to select the output type just as it was on the SEM and the Aviator. The artwork picture below gives you an idea of how the new EA2120 Multimode Filter front panel will look and I have just put the order in for some of these to be made. 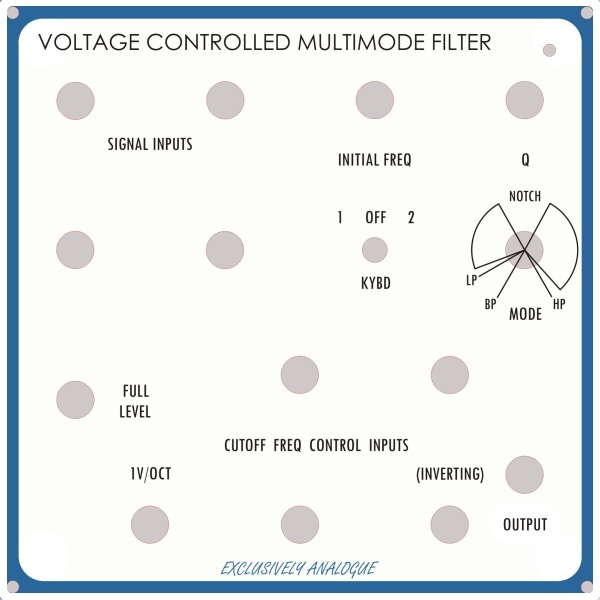 The MultiMode Filter will complement a new “Pioneer” EA2101 24db Low Pass Filter which is based on circuitry similar to the well known SSM2040 IC so with the two modules all the various filtering options will be covered. So back to the soldering iron, PCB design software, and CorelDraw to work on some more modules to add to the new “Pioneer” system. The Dual LFO, Noise and Sample & Hold combined module looks favourite for my attention next.